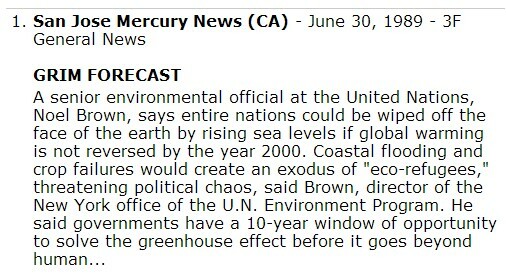 Earth ‘Serially Doomed': UN Issues New 15 Year Climate Tipping Point – But UN Issued Tipping Points in 1982 & Another 10-Year Tipping Point in 1989! But as far back as 1989, the UN was issuing ‘tipping points’ that have now long since expired. The UN claimed in 1989 that the world had to act to solve global warming by the year 2000 — or else! Earth ‘Serially Doomed’: UN Issues New 15 Year Climate Tipping Point – But UN Issued Tipping Points in 1982 & Another 10-Year Tipping Point in 1989! It’s difficult to keep up whether it is hours, days, months or 1000 years. Here are few recent examples of others predicting “tipping points” of various duration. Once again, the world is being warned of an ecological or climate “tipping point” by the UN. Not to be outdone by the UN, Former Irish President Mary Robinson weighed in this week, issuing a more generous 20 year tipping point. “Former president says we have 20 years to save the world from climate change effects…Robinson calls for climate agreement by 2015.” Robinson noted that global leaders have “at most two decades to save the world”. Other global warming activists chose 2047 as the key date. See: Global warming activist scientists may not be the first to proclaim a doomsday year of 2047 as the end of time! — 2047 is the new 2012 — but global warming activists were beaten to Armageddon! — A Climate Depot analysis has uncovered that 2047 has long been seen as a successor to 2012 as an apocalyptic date. Perhaps the best explanation of tipping points comes from UK scientist Philip Stott. NASA scientist James Hansen has been warning of a “tipping point” for years now. 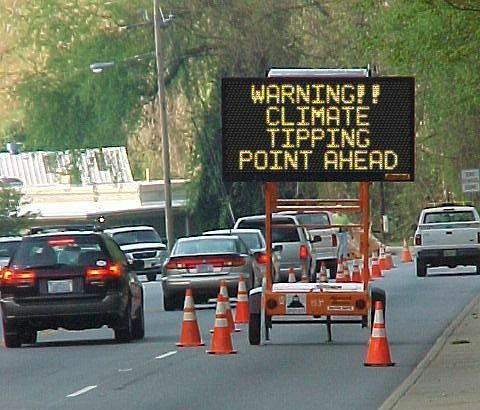 See: Earth’s Climate Approaches Dangerous Tipping Point – June 1, 2007 – Excerpt: A stern warning that global warming is nearing an irreversible tipping point was issued today” by James Hansen. Prince Charles claimed a 96-month tipping point in July 2009. Excerpt: The heir to the throne told an audience of industrialists and environmentalists at St James’s Palace last night that he had calculated that we have just 96 months left to save the world. And in a searing indictment on capitalist society, Charles said we can no longer afford consumerism and that the “age of convenience” was over. The UN chief Ban Ki-moon further shortened the “tipping point” in August 2009, when he warned of ‘incalculable’ suffering without climate deal in December 2009! Newsweek magazine waded into the tipping point claims as well. Newsweek wrote: “The longer the planners delay, the more difficult will they find it to cope with climatic change once the results become grim reality.” But, Newsweek’s “tipping point” quote appeared in a April 28, 1975 article about global cooling! Same rhetoric, different eco-scare. French Foreign Minister issues new tripping point: ’500 Days to Avoid Climate Chaos’ – Laurent Fabius: ‘We have 500 days to avoid climate chaos. And I know that President Obama and John Kerry himself are committed on this subject and I’m sure that with them, with a lot of other friends, we shall be able to reach success on this very important matter.’ – France is scheduled to host the “21st Conference of the Parties on Climate Change” in December 2015, about 565 days from now.